On this day, 181 years ago, John Atkinson Grimshaw was born in Leeds to policeman David Grimshaw and his wife Mary. Originally destined for a quiet and unremarkable life, Atkinson Grimshaw would eventually go on to become one of the most renowned painters of the Victorian era. John Atkinson Grimshaw began his working life as a clerk at the Great Northern Railway, a steady and reliable career picked out for him by his parents. However, his great passion was for art and it was during his time as a clerk that he began to explore this love, much to David and Mary’s chagrin. In 1856, he married his cousin Frances Hubbard and, with her considerable encouragement, began to paint more frequently – finally leaving his job at the GNR in 1861 to become a full-time painter. If his parents had concerns, they would soon prove to be unfounded. Despite being completely self-taught and receiving no official training, Grimshaw had his first exhibit just a year later and over the following decade would become so successful as to rent his own seventeenth-century mansion in Scarborough, affectionately known as the Castle by the Sea. This move to the coast would go on to inspire much of his artwork during that time, including beautiful seascapes that reflected his long-held love for all things maritime. While much of his earlier work had featured still life and nature, it was during this period Grimshaw began to develop his signature moody and ethereal style. Primarily influenced by the Pre-Raphaelite predilection for vivid realism, he also began to experiment with Aestheticism – influenced by James Tissot – painting classical scenes featuring characters from history, mythology, and literature. However, it wasn’t until he turned to his hometown of Leeds and other industrial cities for inspiration that his distinctive nightscapes began to emerge. Favouring docklands and urban settings, he became a master of lighting and weather – accurately capturing the atmosphere of the wet city streets and misty waterside docks that so typified Victorian industrialism. After suffering an unknown financial crisis in the 1880s, Grimshaw retreated to Leeds and began to paint even more prolifically than ever before to counter the resulting debt. Though he would go on to experiment with various different techniques and styles, Grimshaw would most often paint for private collectors in the North and exhibited very rarely for such a popular artist. In fact, it wasn’t until long after his death in 1893 that his work experienced a resurgence in renown. Despite this renown, a lack of personal records, such as letters or diaries, has left the rest of this artist’s private life as mysterious and enigmatic as his misty moonlit landscapes. When he first began painting, Grimshaw could only do so in his spare time and sold his work through a Leeds bookseller. Grimshaw’s love of realism stemmed from a passion for photography and he would often use photography in his work, either using a camera obscura to project scenes onto canvas or painting directly onto photographs. This use of photography was also criticised by his contemporaries who believed it demonstrated less skill than painting by eye. He also enjoyed experimenting with texture and often mixed sand into paint to achieve his desired effect. Whistler was a great admirer of Grimshaw’s work and would later seek his help on mastering perspective. Grimshaw’s daughter once recorded that Whistler would also make fun of Grimshaw for how hard he worked; the artist was known for painting six days a week. Here at Trinity House, we believe this often underrated artist is more than deserving of his resurgence and are privileged to contribute to it with the sale of three of his original paintings; Late Autumn on the Esk, Whitby Harbour, and A Shepherd Driving His Flock & A View Through The Trees. Typical of his versatile body of work, each piece is unique in its own right while beautifully demonstrating the artist’s skilful mastery of light and atmosphere. 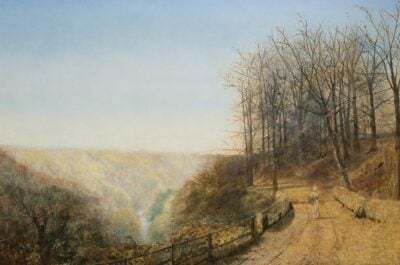 For more information on the artist and our collection, visit our John Atkinson Grimshaw page.